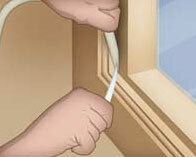 This page includes links to all of our Windows and Double Glazing DIY how to projects. In this area you will find how to guides covering fitting and removing windows, draught proofing sash windows, removing window frames and fitting curtain poles and blinds. Browse through the below list and click on your chosen link to view the project information. Windows - double glazing - How to fit double glazing units correctly, including removing window beads, fitting glass, window sills, end caps and fitting a window frame. Windows - removing glass and putty - How to use a hacking knife or chopping knife, to chop out glass and putty from a window frame. Our pages on windows, double glazing cover a variety of topics which we know to be popular with our users and DIYers in general. We cover how to identify and deal with condensation after showing you just how much damage it can cause. We look especially at condensation and misting in double glazed panels. This section also looks at how to remove a door oe window frame if you are helping out with replacing any windows or doors and you have not called in a door or window replacement company. You should remember that under the building regulations for nearly all replacement windows and doors an approved FENSA contractor must be used in order to issue a certificate to say that the replacements are approved under the regulations. Fensa (Fenestration Self Assessment Scheme) is a scheme authorised by Government which provides competent persons to replace windows and doors. A Fensa registered contractor must be used to ensure compliance with approved document L (Fuel Conservation) of the building regulations. We also cover how lintels are installed and what they do, There are many types of lintel and they all do different jobs, from concrete lintels to cavity lintels. We talk about painting casement windows as well as sash windows, we show you how to replace a sash chord and ease a sticking sash window, We deal with draft proofing windows and how to remove the putty and glass if you need to replace a broken window frame. We also look at how rot can be treated in window and door frames and how to erect a new door liner in a stud partition wall. Our historians tell us that glass was first introduced into windows by the Romans in about 80AD. The first window glass was stained and used as ornate decoration for church windows with clear glass being used in Anglo Saxon houses about the time of the end of the Roman occupation of England in 400AD. Glass itself, in the form of glass beads, jars, ornaments and simple decorations dates back thousands of years.